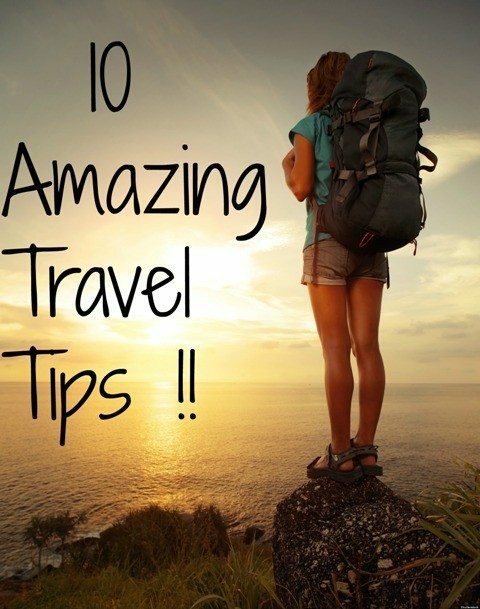 10 Amazing Travel Tips !! Home ReviewsBeauty 10 Amazing Travel Tips !! Travel Tips: Traveling these days has become an essential part of our lives. Gone are the days, of only hill station summer vacations. We have started traveling more often…and for shorter durations. This does not give us enough time, to really relax and unwind. Our entire system, the entire routine takes a hit. Rather than being refreshed buy that vacation, you end up being lethargic, stressed out and feeling low. Here is a simple list of 10 things to do, to make travel stress free! No…I am not asking to set a day by day itinerary! Get a general idea of the things that you want to do, and make sure you have a comfortable time to do them. I would actually recommend you, not to make a detailed plan, as that just takes the spontaneity and fun out. Oh…so you forgot to carry nightwear? Told you so…!I suggest unless it is a short notice journey; you get packed two days in advance. This will help you in two ways. Firstly, hell it will be one job done and over with! Secondly, you are less liable to miss out on stuff. I will write a detailed article on stuff that you must pack later. You are done the planning and have finished your packing. Now please relax…and sleep well. I see a lot of people get travel anxiety. Just try to cover the basics, follow the 1st and 2nd points and relax now. Sleeping well is very essential for traveling. It keeps you feeling fresh and happy. Trust me, if you are groggy and sleep deprived –you will be irritable and you cannot enjoy your vacation then. Whenever you are planning a vacation, please don’t make unrealistic demands on yourself. If you are not a morning person –don’t book that early flight. If you get bored to death during travel, make sure you have some mode of entertainment. If you like to sleep while traveling …make a onetime investment on a neck pillow. Do you know? Take me for example. I HATE early morning flights or even day time flights for that matter. My entire day is wasted if I do that and I get irritable. Whenever I visit my family, I try to travel early morning on the day, I have to join the office. I feel it gives me more time with them. But you know what? That time is actually wasted. The night before I go to bed early, because I need to wake up early. But, since I don’t have a habit of sleeping early, I stay awake till late. Then I have to wake up, after what feels like 5 minutes of sleep….and the whole of next day goes down the drain; because I am too tired. That’s why I am saying know yourself well and don’t be too demanding on your system. Now if you want to wear those skinny jeans with lung stopping top, be my guest. But traveling is one time when you should not feel restricted or conscious. Wear something comfortable. Now, I am not asking you to look like a wayside tramp or a mousy lady. Choose comfortable AND smart clothes! Maybe tights with an oversized T-shirt? Some nice neck piece or bracelet to go with it? Normally we don’t drink the required 8 glasses of water a day. When we are travelling…those 8 glasses become 1 glass. Hydrating yourself is of prime importance. It keeps you fresh, you looking radiant…and it makes sure your immunity is not compromised. Really! Carry a large enough Hobo bag or any other large handbag. Make sure you have basic skincare, medicines, a bottle of water, perfume samples, a protein bar, hair ties, makeup etc handy. At the same time, carry the bare essentials only. No point making the bag so bulky that you hate carrying it around-and cannot find stuff quickly, when you need it! Always eat well and travel on a full stomach. If you have motion sickness…have something to eat 2 hours before and carry around some biscuits or handy snacks. You know, since we travel on an empty stomach, we are more liable to eat expensive and unhealthy lounge food…or food from the wayside restaurant. Do yourself a favor eat well, fuel up your body; and carry some snack with you. ALWAYS! On a road trip? Stop the car for 10 minutes along the countryside. Sit out…breathe the fresh air and relax. Catching a flight? Reach early…have fun window shopping at the airport. Basically, just relax and enjoy your travel time! You will love Bruised Passports for Travel Inspiration! Aloe Vera for Hair :Make Your Own Hair Conditioner Using Patanjali Aloe Vera Gel ! !